This month’s finished object is a quick and easy project that literally only takes a couple of hours to knit up! I feel like I’m cheating but I did knit it this month and it is finished (let’s ignore all the other projects hanging about needles all over the house right now…) I was invited to a surprise 60th birthday party for one of my knitting friends, we’ll call her AH. The theme was 60 Shades of Gray (ha ha!). AH had very kindly made made us paper woven hearts for Christmas and they reminded me of the Dansk Hjerte pattern that was published in the Interweave Knits, Holiday Gifts 2012 issue. I had made one for a co-worker for Christmas in 2013. We talked about the knitting version and I never got around to digging out my copy of the magazine. So, her birthday was a great excuse to make her one! I bought two shades of gray Jamieson’s Shetland Spindrift and set off to work. I was super excited! I still had yarn left so I made another heart for the Fluffy Fibers tea swap. If you’ve never listened to the Fluffy Fibers podcast highly recommend it! Of course, I’m a huge lover of France so I love listening to Isabelle talk about the beautiful south of France. A few months ago one of her listeners suggested a tea swap as Isabelle almost always talks about what tea she is drinking. It was super fun and it was the first time I’ve participated in a swap on Ravelry. 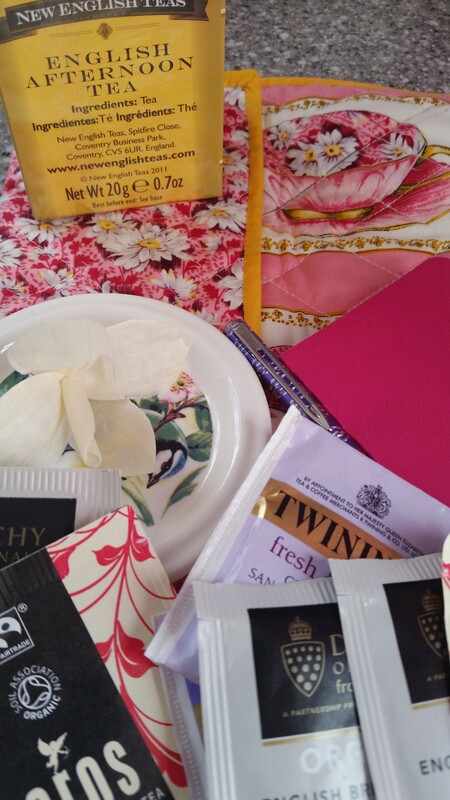 We were to include a few bags of tea, a note explaining our tea choices and a small crafted or tea related item. 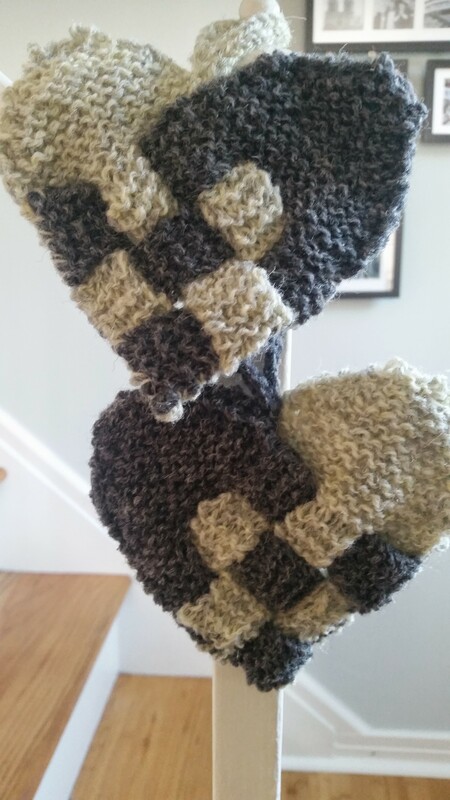 My original plan was to knit up a small drawstring bag but that was going super slow and I was time crunched and that’s when it hit me – another heart! I sent the heart, loose tea from the Tea Lab which is a cool, local tea shop, a couple of sugar stirs and some tea bags to use with the loose tea off to England. So, there’s Cleveland tea over in jolly old England! I received a package from a different person in England. It included several bags of tea including English Breakfast and English Afternoon tea – gotta love they distinguish between morning and afternoon tea! A small, I believe tea bag placing plate and then you can see in the picture the pink (which matches my kitchen excactly!) tea cloth I received. I did not exactly know what it was but I’ve noticed in pictures from British knitters on Instagram that it appears they use these as pads for their tea set up. Excellent idea! I don’t know how other swaps on Ravelry work but it was a great first experience. I especially loved the global element involved with this one. Another perk of the swap – I got a random message from one of the participants, she had noticed I specified a particular type of French tea I enjoy but have a hard time finding in the States and she sent me a link to a tea shop in Dallas that carries a nice variety! I love knitters! So, my friend loved her two shades of gray heart and was super surprised at her party! And, my other heart made it’s way across the pond! They were quick knits but well appreciated by fellow knitters and it really is a great gift idea and can be made in any other color combination with any stash you have around the house! I love this post, Jen! So heartwarming. (no pun intended). I need to knit these hearts since we used to make woven paper ones for May Day when I was a kid. And I love tea and tea time……. Thanks Marie!!! When I finally make it to WI we will have to a cup of tea! How I balance being a Wife, a Mom and a Crafter!